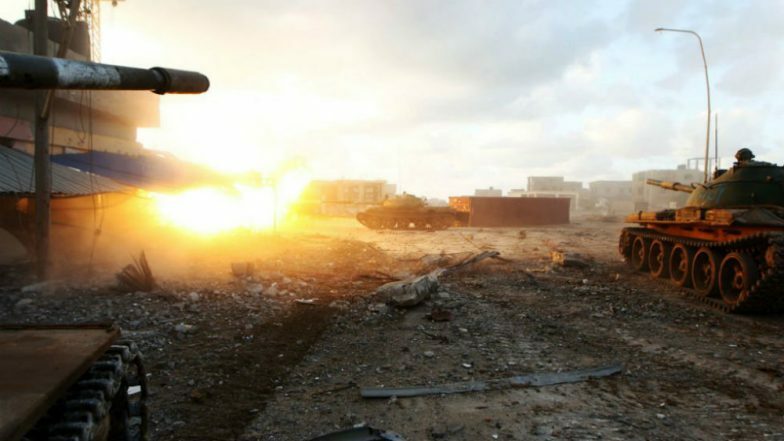 Tripoli, April 8: Libya's UN-backed government says 21 people have been killed and 27 wounded in fighting near the capital, Tripoli. Earlier the UN appealed for a two-hour truce so casualties and civilians could be evacuated, but fighting continued. Rebel forces under Gen Khalifa Haftar have advanced from the east with the aim of taking Tripoli, the BBC reported. Indian Peacekeepers Pulled Out of Tripoli As Libya Roiled by Factional Violence. Prime Minister Fayez al-Serraj has accused him of attempting a coup and says rebels will be met with force. Among the dead was a Red Crescent doctor killed on Saturday. Gen Haftar's forces said they had lost 14 fighters. International powers have begun evacuating personnel from Libya amid the worsening security situation. Libya has been torn by violence and political instability since long-time ruler Muammar Gaddafi was deposed and killed in 2011.